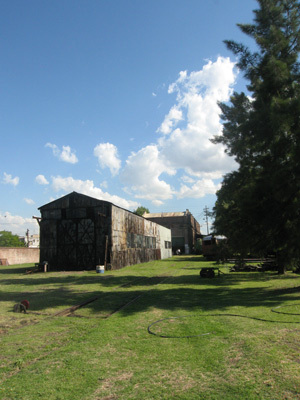 Remedios de Escalada in the southern suburbs of Buenos Aires may be off most people’s radar, but it contains a testament to Argentina’s industrial past that’s very interesting: the largest, privately-owned railroad workshop that the British built outside of the UK. 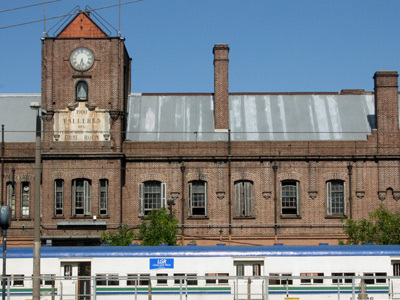 The workshop & train museum occupy a massive site… over 1,250,000 square meters which housed all kinds of workshops, repair & production facilities. A ton of info can be found here (in Spanish), but to sum it up the need for more space drove the workshops away from Barracas out to the suburbs in 1900. 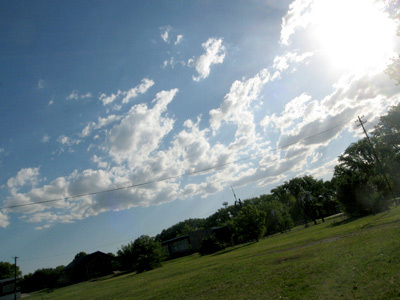 As time went by, more facilities were added to handle new developments in technology. 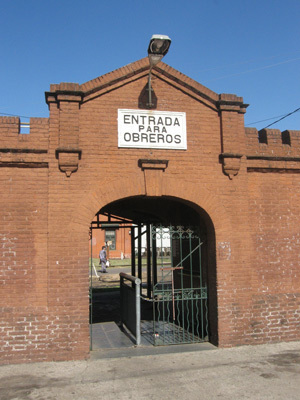 It survived both world wars by fabricating its own parts instead of importing from England & became an important training center after nationalization under Perón. 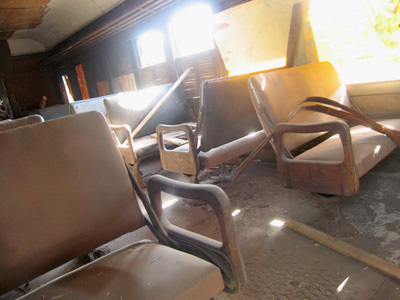 But the decline of Argentina’s rail network also meant the decline of this facility. 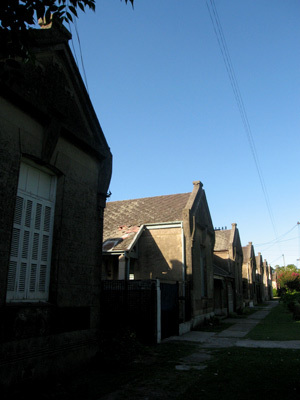 Only partially used today, most of the area currently houses the museum & a campus for the Universidad Nacional de Lanús. 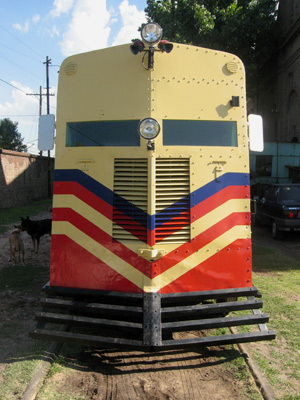 The Dutch equipment was pretty classy with obvious Rationalist elements… made from Argentine designs & waiting for restoration. I’d hoped to see a diesel engine that Luis recommended, a restored 1953 Baldwin Lima Hamilton, because evidently there are none left in the US. Maybe it was in storage in one of the warehouses the day we visited. Very few of the semi-detached/duplex units have their original diamond-pattern roof sheeting, & most of the open patios have now been fenced in. Still, the houses aren’t in bad shape considering they’ve been around for over a century. They all have large yards in the back… a luxury these days. Sorry about the bad light, but it was after 20:00. Lots to see in one afternoon! If you want to wait til December, I will go with you. I will be in BsAs in early December, would love to go. That would be great because I really need to get better photos. But I’ll be in Esquel from 21 Nov until 21 Dec. Will you still be around at the end of the month?? A trip out to Haedo or Lynch would be great too. Saludos! Unfortunately we will miss each other again. I still have my youngest in his final year of high school this year, makes travel difficult, as trips must be infrequent and short. Looking forward to more time in Argentina starting next year. Esquel sounds quite interesting- looks very cool from satellite pics. I am slowly logging all the transport museums- I think I have at least 3 more good auto museums to hit, along with several trains. 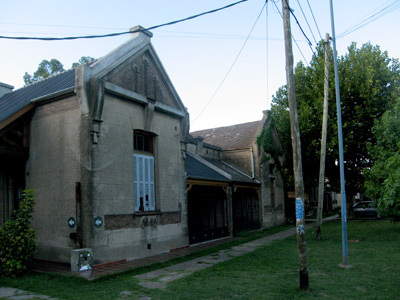 Did you go to Tafi Viejo when you were in Tucuman? 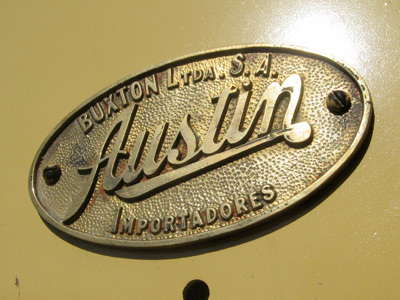 I’ve yet to go to the auto museum in Villa Pueyrredón… or is it Villa Real? 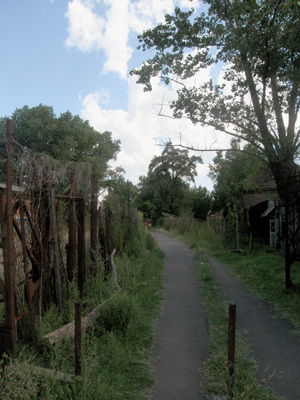 One of those smaller western barrios. And I intended to go to Tafí Viejo, especially because I wanted to compare it to Remedios de Escalada. But we were out late the night before, it wasn’t clear which bus to take to get there & tourist information didn’t know what to tell me. I guess I’ll have to go back to Tucuman! Let me know what you think of Remedios de Escalada if you go. Saludos! the museo de automovil is on Irigoyen in Villa Real. Havent been there yet, although I have been to the one at the ACA, on Libertador, and while there got to help push a classic 1930’s argentine sports car into its parking slot. there is also a nice little auto museum in La Plata I have been to- near the bus station. its called the collecion rau. Like you, though, I am quite interested in the architectura as well, and that would be a big draw for me to go to Remedios de Escalada. 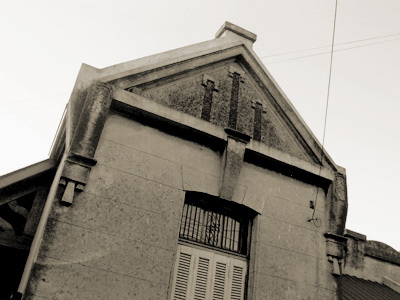 To be honest, Remedios de Escalada is a bit of a black hole (hopefully my ex won’t read this… he’s from there), but what is really fascinating are the houses built for the railroad bosses on the main avenue. Didn’t get any photos because it was too dark when we made it there, but it’s definitely worth checking out. If you care to visit another time you visit Argentina . 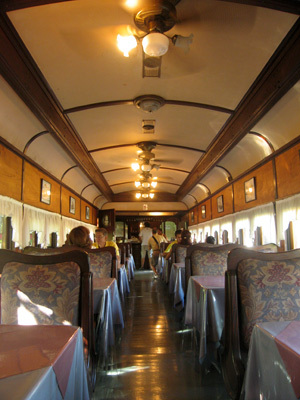 There is a Miniature Train Museum in La Falda, provincia de Córdoba. 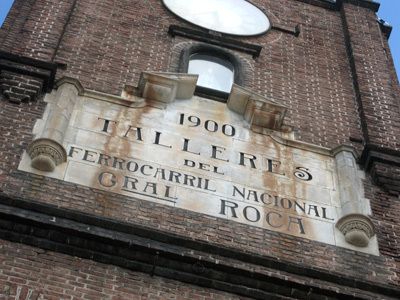 My father worked at Talleres de Remedios de Escalada and left in the 1970’s. Thank you for the recommendation, Jane. I’ve lived in Buenos Aires for over 10 years, but unfortunately I rarely make it to Córdoba. I will definitely keep it in mind if I return. 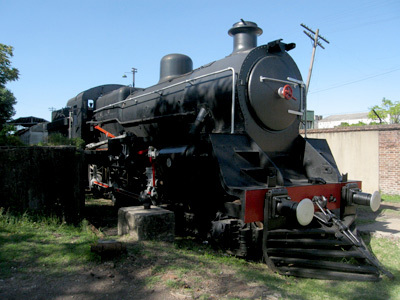 There is another train workshop in Tafí Viejo near San Miguel de Tucumán that I should have visited as well. However, we were only there for a long weekend & ran out of time. If your family has any old photographs of Remedios de Escalada, I would be happy to post them here. Saludos!